MPAA Rating: PG-13 for thematic material including sequences of gun violence and action. Running time: 95 minutes. Distributed by Columbia Pictures. It would be easy to begin with the sentence which both begins and ends Stephen King’s eight-part “Dark Tower” saga. However, it bears no weight since it has very little to do with the film itself. The Man In Black, a.k.a. 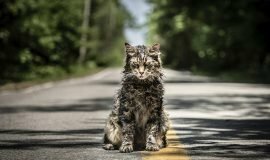 Walter o’Dim (Matthew McConaughey) is not fleeing from anything or anyone. 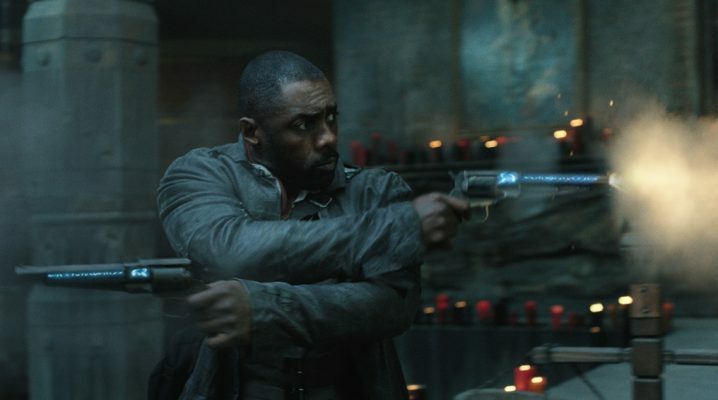 The Gunslinger, Roland Deschain (Idris Elba) is not following him across the desert. 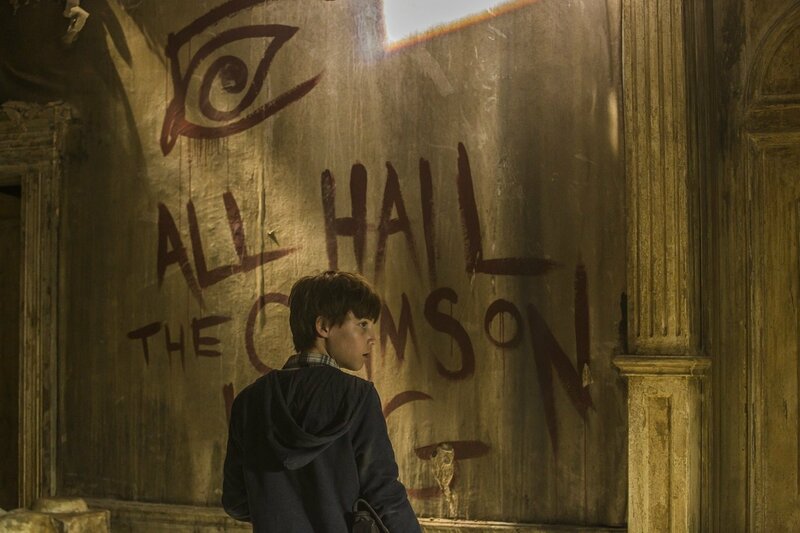 And Jake Chambers (Tom Taylor) is alive in New York City, bullied and ostracized because of his prophetic dreams and the drawings he makes from them. 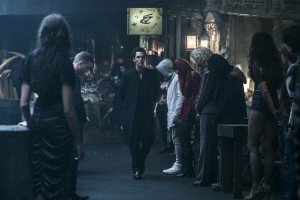 Welcome to the The Dark Tower, which its filmmakers (and King himself) claim to be a continuation of the series, not a straight-up adaptation. All who come are invited: the King fans, the casual readers, the fans of the novels, and those who’ve never picked up a “Dark Tower” book in their life. Those expecting a revelatory experience will be let down, as the script takes portions of the gigantic Old West mythos of the novels and shapes it into an easily-digestible science-fiction film. This tone-shift is neither here nor there. Its main problem is it doesn’t know what it wants to do with itself, which is often what happens when films are written by committee. Almost as a testament to its long journey to the screen, The Dark Tower boasts four credited screenwriters – Akiva Goldsman, Jeff Pinkner, Anders Thomas Jensen, and director Nikolaj Arcel (the latter two rewriting Goldsman and Pinkner’s previous efforts). Story focus and urgency are no problems; the film ticks away its 95 minutes at an entertainingly quick pace. What happens in those 95 minutes, though, is quite another issue. The “Dark Tower” series was an examination of one man’s quest to end the reign of his nemesis, The Man In Black, and what he’d do to achieve that end. 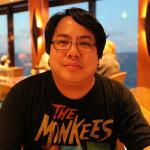 It’s a swirling epic, with characters moving in and out of his life like hotel guests through a revolving door. With this in mind, the expectation of the filmed continuation conjures up thoughts of a romantic Old West setting pockmarked by the supernatural. Surprising no one, the film has a curious “been there, done that” quality ill-befitting a chapter in this storied saga. 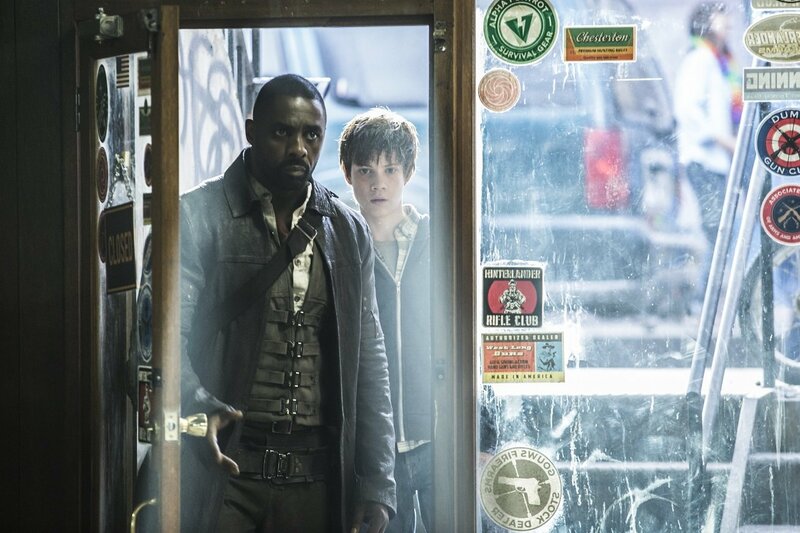 The Dark Tower’s greatest problem is it takes absolutely zero risks in its effort to make King’s beast of a story palatable to the average filmgoer. 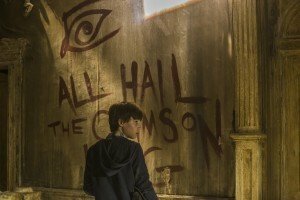 Right away, the film lets us know we’re going down a familiar path with its opening text, which prophesizes the coming of a child capable of destroying the titular Dark Tower. And if that weren’t enough, The Man in Black is directing all his efforts at finding children to do just that. Jake can only watch in his nightmares as each attempt at the Tower’s destruction causes havoc – earthquakes, massive storms – in his real-life existential plane. He dreams of adults who wear fake skin, and of Roland, whose blazing guns seem to be the answer to this ruin. (It’s almost like Phantasm II all over again, only with guns instead of spheres and flamethrowers.) And when those dubious adults threaten to take him away from his family, Jake goes on the run, eventually crossing over to Roland’s world. 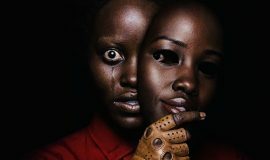 The screenplay takes precious time out to set up the fake-skinned adults, along with other ideas and concepts (such as a “house demon” and an adult who’s seen the other world), but ultimately does nothing with them. So many opportunities to choose more interesting, creative paths are passed up in favor of a homogenized big screen blowout. 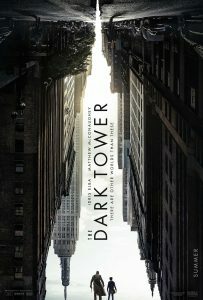 It’s entirely too safe for the world of “The Dark Tower” series, with no suspense or high drama where there should be. And if there’s one thing which keeps movies from being good, it’s that word: “safe.” There is no edge to The Dark Tower, which – considering its life-or-hell struggle – it so desperately needs. Matthew McConaughey struts darkly through each frame he’s in, as he’s meant to be a figure in control and so close to his goal of ending the universe. But his underplayed Man in Black has no bite, content enough to be the voice in Roland’s head. It’s not a standout performance, and maybe it’s not meant to be, but any number of actors could have played it just the same. Why choose McConaughey if you’re not going to let him a little ways off the chain, then? 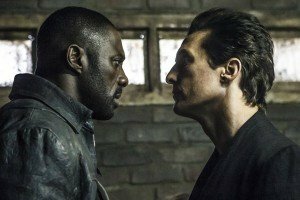 Yet it’s still too little to overcome the rote vibe of The Dark Tower. It’s a film which goes through the motions of being an action-fantasy without having the guts to proclaim it from the heavens, which is what it deserves. 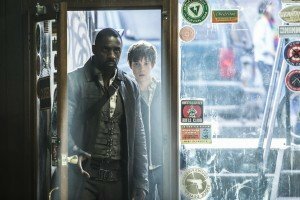 A little more intensity and less time spent making the “Dark Tower” mythos fit into a Hollywood box would have served The Dark Tower well. But when complication is eschewed in favor of the easily-swallowed, what so wants to be a challenging work of art winds up falling short.